Ventec Life Systems has secured 510(k) clearance from the US Food and Drug Administration (FDA) for its portable unified respiratory system, Vocsn. The new portable life support device is said to combine five respiratory therapies, including ventilation, oxygen, cough, suction and nebulization. Vocsn is a portable critical care ventilator, which offers invasive, noninvasive and mouthpiece ventilation. Developed to be used for pediatric patients weighing more than 5 kg to adults, Vocsn can be used in various settings ranging from the hospital to home. The new device, which can be used in hospital, institutional, transport and home environments, will deliver a comprehensive set of ventilation modes and settings to meet patient needs. It is a portable oxygen concentrator that can deliver the equivalent of 6 L/min of oxygen. 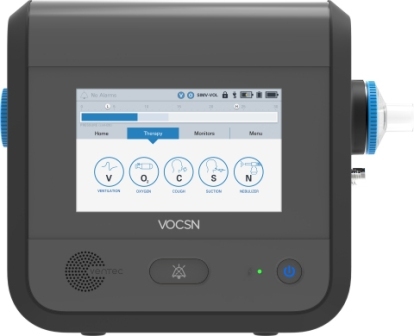 Vocsn can be connected to external oxygen sources for critical care patients, in addition to the on-board internal oxygen concentrator. It also includes an onboard FiO2 monitor to verify accurate oxygen delivery. The company has developed Vocsn to treat patients with neuromuscular disease, impaired lung function spinal cord injury and pediatric development complication. With a nine-hour on-board battery, the new respiratory system can be controlled through an advanced touchscreen interface and user-friendly operating system. Vocsn will enable caregivers to switch between therapies with the touch of a button and avoids to change the patient circuit between therapies. With eight pending patents, the company has engineered and manufactured Vocsn in the US. Ventec founder and CEO Doug DeVries said: “I’ve seen firsthand how improved ventilator technology can enhance the quality of life for patients and caregivers. Image: Vocsn integrates five separate medical devices such as ventilator, oxygen concentrator, cough assist, suction and nebulizer. Photo: courtesy of Business Wire.